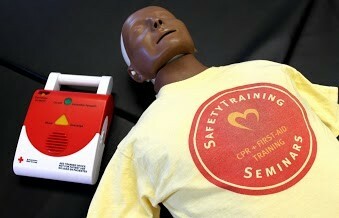 San Jose CPR students are responsible for selecting the correct CPR training class. If you have any confusion, please read through our descriptions of the classes we offer in San Jose or you could speak to a coworker. The San Jose child care licensing laws require staff are trained in CPR and First-aid by EMSA or American Heart Association. Where is the Santa Clara Classroom? No worries. Other CPR companies ask for prepayment and if you cancel with less than 14 days notice, you will not receive a refund. But not us. At San Jose CPR Classes, you don’t have to pay until you arrive and if you cancel, no problem. A check made out to Safety Training Seminars or cash. But no credit cards. There is an ATM close by in FoodMaxx. What if I have knee or back problems? Our San Jose Classroom has tables that you can practice on. The price is $30 to replace a lost card. You can call us at 408-724-9985. I signed up and took the wrong class. What do I do? If you registered for the wrong class, you can return and bring your card (within one month) and take the other class for half price. When do the CPR and First-aid cards expire? The American Heart Association CPR and First-aid cards are valid for 2 years. I have seen online CPR classes on the internet. Can I take one of these? Warning: There are a lot of scams in San Jose and on the internet for fake CPR classes. Do not let yourself get ripped off by one of those online CPR classes. The certification you receive for these online classes is not valid and not accepted for any type of jobs. Also those online classes do not provide any practice time so students cannot learn how to perform CPR properly. Do it right the first time and take an official American Heart Association CPR class. AEDs for sale in San Jose?